This article is about the supra-national region. For other uses, see Macedonia. Macedonia (/ˌmæsɪˈdoʊniə/ ( listen)) is a geographical and historical region of the Balkan Peninsula in Southeast Europe. Its boundaries have changed considerably over time; however, it came to be defined as the modern geographical region by the mid 19th century. Today the region is considered to include parts of six Balkan countries: Greece, North Macedonia, Bulgaria, Albania, Serbia, and Kosovo. [a] It covers approximately 67,000 square kilometres (25,869 sq mi) and has a population of 4.76 million. Its oldest known settlements date back approximately to 7,000 BC. From the middle of the 4th century BC, the Kingdom of Macedon became the dominant power on the Balkan Peninsula; since then Macedonia has had a diverse history. The definition of Macedonia has changed several times throughout history. Prior to its expansion under Alexander the Great, the ancient kingdom of Macedonia, to which the modern region owes its name, lay entirely within the central and western parts of the current Greek province of Macedonia and was consisted of 17 provinces/districts or eparchies (Ancient Greek: επαρχία). Kingdom of Perdiccas I: Macedonian Kingdom of Emathia consisting of six provinces Emathia, Pieria, Bottiaea, Mygdonia, Eordaea and Almopia. Kingdom of Alexander I: All the above provinces plus the eastern annexations Crestonia, Bisaltia and the western annexations Elimiotis, Orestis and Lynkestis. Kingdom of Philip II: All the above provinces plus the appendages of Pelagonia and Macedonian Paeonia to the north, Sintike, Odomantis and Edonis to the east and the Chalkidike to the south. In the 2nd century, Macedonia covered approximately the area where it is considered to be today, but the northern regions of today Republic of North Macedonia were not identified as Macedonian lands. For reasons that are still unclear, over the next eleven centuries Macedonia's location was changed significantly. The Roman province of Macedonia consisted of what is today Northern and Central Greece, much of the geographical area of the present-day Republic of North Macedonia and southeast Albania. Simply put, the Romans created a much larger administrative area under that name than the original ancient Macedon. In late Roman times, the provincial boundaries were reorganized to form the Diocese of Macedonia, consisting of most of modern mainland Greece right across the Aegean to include Crete, southern Albania, parts of south-west Bulgaria and southern Republic of North Macedonia. The modern geographical region of Macedonia shown in blue. The region is divided by the national boundaries of Greece (Greek Macedonia), the Republic of North Macedonia, Bulgaria (Blagoevgrad Province), Albania (Mala Prespa and Golo Brdo), Serbia (Prohor Pčinjski), and Kosovo (Gora). In the Byzantine Empire, a province under the name of Macedonia was carved out of the original Theme of Thrace, which was well east of the Struma River. This thema variously included parts of Thrace and gave its name to the Macedonian dynasty. Hence, Byzantine documents of this era that mention Macedonia are most probably referring to the Macedonian thema. The region of Macedonia, on the other hand, which was ruled by the First Bulgarian Empire throughout the 9th and the 10th century, was incorporated into the Byzantine Empire in 1018 as the Themе of Bulgaria. With the gradual conquest of southeastern Europe by the Ottomans in the late 14th century, the name of Macedonia disappeared as an administrative designation for several centuries and was rarely displayed on maps. The name was again revived to mean a distinct geographical region in the 19th century, defining the region bounded by Mount Olympus, the Pindus range, mounts Shar and Osogovo, the western Rhodopes, the lower course of the river Mesta (Greek Nestos) and the Aegean Sea, developing roughly the same borders that it has today. During medieval and modern times, Macedonia has been known as a Balkan region inhabited by ethnic Greeks, Albanians, Vlachs, Serbs, Bulgarians, Jews, and Turks. Today, as a frontier region where several very different cultures meet, Macedonia has an extremely diverse demographic profile. 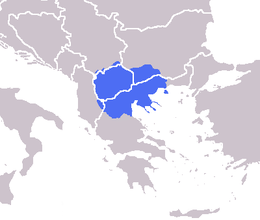 Macedonian Greeks self-identify culturally and regionally as "Macedonians" (Greek: Μακεδόνες, Makedónes). They form the majority of the region's population (~51%). They number approximately 2,500,000 and, today, they live almost entirely in Greek Macedonia. The Greek Macedonian population is mixed, with other indigenous groups and with a large influx of Greek refugees descending from Asia Minor, Pontic Greeks, and East Thracian Greeks in the early 20th century. This is due to the population exchange between Greece and Turkey, during which over 1.2 million Orthodox Christian refugees from Turkey were settled in Greece, 638,000 of whom were settled in the Greek province of Macedonia. Smaller Greek minorities exist in Bulgaria and the Republic of North Macedonia, although their numbers are difficult to ascertain. In official census results, only 86 persons declared themselves Greeks in Bulgarian Macedonia (Blagoevgrad Province) in 2011, out of a total of 1,379 in all Bulgaria; while only 442 persons described themselves as Greeks in the 2002 census in the Republic of North Macedonia. Ethnic Macedonians self-identify as "Macedonians" (Macedonian: Македонци, Makedonci) in an ethnic sense as well as in the regional sense. They are the second largest ethnic group in the region. Because of their primarily Slavic origin they are also known as "Macedonian Slavs" and "Slav Macedonians" (Greek: Σλαβομακεδόνες, "Slavomakedones"). They form the majority of the population in the Republic of North Macedonia where according to the 2002 census, approximately 1,300,000 people declared themselves as Macedonians. According to the latest Bulgarian census held in 2011, there are 561 people declaring themselves ethnic Macedonians in the Blagoevgrad Province of Bulgaria (Pirin Macedonia). The official number of ethnic Macedonians in Bulgaria is 1,654. A relatively small number of ethnic Macedonians exist among the Slavic-speakers of Greek Macedonia. There has not been a census in Greece on the question of mother tongue since 1951, when the census recorded 41,017 Slavic-speakers, mostly in the West Macedonia periphery of Greece. The linguistic classification of the Slavic dialects spoken by these people can be either Bulgarian or Macedonian, although the people themselves call their language "Slavic". Most of these people declare themselves as ethnic Greeks (Slavophone Greeks), although there are small groups espousing ethnic Macedonian and Bulgarian national identities. In the 2011 Albanian census, 5,870 Albanian citizens declared themselves Macedonians. Macedonian Bulgarians are ethnic Bulgarians who self-identify regionally as "Macedonians" (Bulgarian: Mакедонци, Makedontsi). They represent the bulk of the population of Bulgarian Macedonia (also known as "Pirin Macedonia"). They number approximately 250,000 in the Blagoevgrad Province where they are mainly situated. There are small Bulgarian-identifying groups in Albania, Greece and the Republic of North Macedonia with an uncertain size. In the Republic of North Macedonia, 1,417 people claimed a Bulgarian ethnic identity in the 2002 census. Paradoxically, during the last few years around 53,000 Macedonians have applied for Bulgarian citizenship and more than 70,000 ethnic Macedonians have already obtained Bulgarian passports. Bulgaria's admission to the European Union is evidently a powerful motivation factor. In order to obtain it they must sign a statement proving they are Bulgarian by origin, effectively not recognizing their rights as a minority. Albanians are another major ethnic group in the region. Ethnic Albanians make up the majority in certain northern and western parts of the Republic of North Macedonia, and account for 25.2% of the total population of the Republic of North Macedonia, according to the 2002 census. Smaller numbers of Turks, Bosniaks, Roma, Serbs, Vlachs (Aromanians and Megleno-Romanians), Egyptians, Armenians and Jews (Sephardim and Romaniotes) can also be found in Macedonia. Most present-day inhabitants of the region are Eastern Orthodox Christians, principally of the Greek Orthodox, Bulgarian Orthodox, Serbian Orthodox and Macedonian Orthodox Churches. Notable Muslim minorities are present among the Albanian, Bulgarian (Pomaks), Macedonian (Torbeš), Bosniak, and Turkish populations. While Macedonia shows signs of human habitation as old as the paleolithic period (among which is the Petralona cave with the oldest European humanoid), the earliest known settlements, such as Nea Nikomedeia in Imathia (today's Greek Macedonia), date back 9,000 years. The houses at Nea Nikomedeia were constructed—as were most structures throughout the Neolithic in northern Greece—of wattle and daub on a timber frame. The cultural assemblage includes well-made pottery in simple shapes with occasional decoration in white on a red background, clay female figurines of the 'rod-headed' type known from Thessaly to the Danube Valley, stone axes and adzes, chert blades, and ornaments of stone including curious 'nose plugs' of uncertain function. The assemblage of associated objects differs from one house to the next, suggesting some degree of craft specialisation had already been established from the beginning of the site's history. The farming economy was based on the cultivation of cereal crops such as wheat and barley and pulses and on the herding of sheep and goats, with some cattle and pigs. Hunting played a relatively minor role in the economy. Surviving from 7000 to 5500 BCE, this Early Neolithic settlement was occupied for over a thousand years. The Middle Neolithic period (c. 5500 to 4500 BCE) is at present best represented at Servia in the Haliacmon Valley in western Macedonia, where the typical red-on-cream pottery in the Sesklo style emphasises the settlement's southern orientation. Pottery of this date has been found at a number of sites in Central and Eastern Macedonia but so far none has been extensively excavated. The Late Neolithic period (c. 4500 to 3500 BCE) is well represented by both excavated and unexcavated sites throughout the region (though it should be noted that in Eastern Macedonia levels of this period are still called Middle Neolithic according to the terminology used in the Balkans). Rapid changes in pottery styles, and the discovery of fragments of pottery showing trade with quite distant regions, indicate that society, economy and technology were all changing rapidly. Among the most important of these changes were the start of copper working, convincingly demonstrated by Renfrew to have been learnt from the cultural groups of Bulgaria and Roumania to the North. Principal excavated settlements of this period include Makryialos and Paliambela near the western shore of the Thermaic gulf, Thermi to the south of Thessaloniki and Sitagroi and Dikili Tas in the Drama plain. Some of these sites were densely occupied and formed large mounds (known to the local inhabitants of the region today as 'toumbas'). Others were much less densely occupied and spread for as much as a kilometer (Makryialos). Both types are found at the same time in the same districts and it is presumed that differences in social organisation are reflected by these differences in settlement organisation. Some communities were clearly concerned to protect themselves with different kinds of defensive arrangements: ditches at Makryialos and concentric walls at Paliambela. The best preserved buildings were discovered at Dikili Tas, where long timber-framed structures had been organised in rows and some had been decorated with bulls' skulls fastened to the outside of the walls and plastered over with clay. Remarkable evidence for cult activity has been found at Promachonas-Topolnica, which straddles the Greek Bulgarian border to the north of Serres. Here a deep pit appeared to have been roofed to make a subterranean room; in it were successive layers of debris including large numbers of figurines, bulls' skulls, and pottery, including several rare and unusual shapes. The farming economy of this period continued the practices established at the beginning of the Neolithic, although sheep and goats were less dominant among the animals than they had previously been, and the cultivation of vines (Vitis vinifera) is well attested. Only a few burials have been discovered from the whole of the Neolithic period in northern Greece and no clear pattern can be deduced. Grave offerings, however, seem to have been very limited. In classical times, the region of Macedonia comprised parts of what at the time was known as Macedonia, Illyria and Thrace. Among others, in its lands were located the kingdoms of Paeonia, Dardania, Macedonia and Pelagonia, historical tribes like the Agrianes, and colonies of southern Greek city states. Prior to the Macedonian ascendancy, parts of southern Macedonia were populated by the Bryges, while western, (i. e., Upper) Macedonia, was inhabited by Macedonian and Illyrian tribes. Whilst numerous wars are later recorded between the Illyrian and Macedonian Kingdoms, the Bryges might have co-existed peacefully with the Macedonians. In the time of Classical Greece, Paionia, whose exact boundaries are obscure, originally included the whole Axius River valley and the surrounding areas, in what is now the northern part of the Greek region of Macedonia, most of the Republic of North Macedonia, and a small part of western Bulgaria. 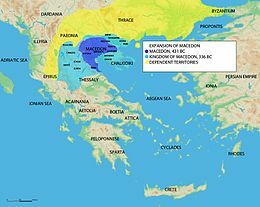 By 500 BCE, the ancient kingdom of Macedon was centered somewhere between the southern slopes of Lower Olympus and the lowest reach of the Haliakmon River. Since 512/511 BCE, the kingdom of Macedonia was subject to the Persians, but after the battle of Plataia it regained its independence. Under Philip II and Alexander the Great, the kingdom of Macedonia forcefully expanded, placing the whole of the region of Macedonia under their rule. Alexander's conquests produced a lasting extension of Hellenistic culture and thought across the ancient Near East, but his empire broke up on his death. His generals divided the empire between them, founding their own states and dynasties. The kingdom of Macedon was taken by Cassander, who ruled it until his death in 297 BC. At the time, Macedonian control over the Thracoillyrian states of the region slowly waned, although the kingdom of Macedonia remained the most potent regional power. This period also saw several Celtic invasions into Macedonia. However, the Celts were each time successfully repelled by Cassander, and later Antigonus, leaving little overall influence on the region. Macedonian sovereignty in the region was brought to an end at the hands of the rising power of Rome in the 2nd century BC. Philip V of Macedon took his kingdom to war against the Romans in two wars during his reign (221-179 BC). The First Macedonian War (215-205 BC) was fairly successful for the Macedonians but Philip was decisively defeated in the Second Macedonian War in (200-197 BC). Although he survived war with Rome, his successor Perseus of Macedon (reigned 179-168 BC) did not; having taken Macedon into the Third Macedonian War in (171-168 BC), he lost his kingdom when he was defeated. Macedonia was initially divided into four republics subject to Rome before finally being annexed in 146 BC as a Roman province. Around this time, vulgar Latin was introduced in the Balkans by Latin-speaking colonists and military personnel. With the division of the Roman Empire into west and east in 298 AD, Macedonia came under the rule of Rome's Byzantine successors. The population of the entire region was, however, depleted by destructive invasions of various Gothic and Hun tribes c. 300 – 5th century AD. Despite this, other parts of the Byzantine empire continued to flourish, in particular some coastal cities such as Thessaloniki became important trade and cultural centres. Despite the empire's power, from the beginning of the 6th century the Byzantine dominions were subject to frequent raids by various Slavic tribes which, in the course of centuries, eventually resulted in drastic demographic and cultural changes in the Empire's Balkan provinces. Although traditional scholarship attributes these changes to large-scale colonizations by Slavic-speaking groups, it has been proposed that a generalized dissipation of Roman identity might have commenced in the 3rd century, especially among rural provincials who were crippled by harsh taxation and famines. Given this background, penetrations carried by successive waves of relatively small numbers of Slavic warriors and their families might have been capable of assimilating large numbers of indigenes into their cultural model, which was sometimes seen as a more attractive alternative. In this way and in the course of time, great parts of Macedonia came to be controlled by Slavic-speaking communities. Despite numerous attacks on Thessaloniki, the city held out, and Byzantine-Roman culture continued to flourish, although Slavic cultural influence steadily increased. The Slavic settlements organized themselves along tribal and territorially based lines which were referred to by Byzantine Greek historians as "Sklaviniai". The Sklaviniai continued to intermittently assault the Byzantine Empire, either independently, or aided by Bulgar or Avar contingents. Around 680 AD a "Bulgar" group (which was largely composed of the descendants of former Roman Christians taken captive by the Avars), led by Khan Kuber (theorized to have belonged to the same clan as the Danubian Bulgarian khan Asparukh), settled in the Pelagonian plain, and launched campaigns to the region of Thessaloniki. When the Empire could spare imperial troops, it attempted to regain control of its lost Balkan territories. By the time of Constans II a significant number of the Slavs of Macedonia were captured and transferred to central Asia Minor where they were forced to recognize the authority of the Byzantine emperor and serve in his ranks. In the late 7th century, Justinian II again organized a massive expedition against the Sklaviniai and Bulgars of Macedonia. Launching from Constantinople, he subdued many Slavic tribes and established the Theme of Thrace in the hinterland of the Great City, and pushed on into Thessaloniki. However, on his return he was ambushed by the Slavo-Bulgars of Kuber, losing a great part of his army, booty, and subsequently his throne. Despite these temporary successes, rule in the region was far from stable since not all of the Sklaviniae were pacified, and those that were often rebelled. The emperors rather resorted to withdrawing their defensive line south along the Aegean coast, until the late 8th century. Although a new theme—that of "Macedonia"—was subsequently created, it did not correspond to today's geographic territory, but one farther east (centred on Adrianople), carved out of the already existing Thracian and Helladic themes. There are no Byzantine records of "Sklaviniai" after 836/837 as they were absorbed into the expanding First Bulgarian Empire. Slavic influence in the region strengthened along with the rise of this state, which incorporated parts of the region to its domain in 837. In the early 860s Saints Cyril and Methodius, two Byzantine Greek brothers from Thessaloniki, created the first Slavic Glagolitic alphabet in which the Old Church Slavonic language was first transcribed, and are thus commonly referred to as the apostles of the Slavic world. Their cultural heritage was acquired and developed in medieval Bulgaria, where after 885 the region of Ohrid (present-day Republic of North Macedonia) became a significant ecclesiastical center with the nomination of the Saint Clement of Ohrid for "first archbishop in Bulgarian language" with residence in this region. In conjunction with another disciple of Saints Cyril and Methodius, Saint Naum, Clement created a flourishing Slavic cultural center around Ohrid, where pupils were taught theology in the Old Church Slavonic language and the Glagolitic and Cyrillic script at what is now called Ohrid Literary School. The Bulgarian-Byzantine boundary in the beginning of 10th century passed approximately 20 km (12 mi) north of Thessaloniki according to the inscription of Narash. According to the Byzantine author John Kaminiates, at that time the neighbouring settlements around Thessaloniki were inhabited by "Scythians" (Bulgarians) and the Slavic tribes of Drugubites and Sagudates, in addition to Greeks. At the end of the 10th century, what is now the Republic of North Macedonia became the political and cultural heartland of the First Bulgarian Empire, after Byzantine emperors John I Tzimiskes conquered the eastern part of the Bulgarian state during the Rus'–Byzantine War of 970–971. The Bulgarian capital Preslav and the Bulgarian Tsar Boris II were captured, and with the deposition of the Bulgarian regalia in the Hagia Sophia, Bulgaria was officially annexed to Byzantium. A new capital was established at Ohrid, which also became the seat of the Bulgarian Patriarchate. A new dynasty, that of the Comitopuli under Tsar Samuil and his successors, continued resistance against the Byzantines for several more decades, before also succumbing in 1018. The western part of Bulgaria including Macedonia was incorporated into the Byzantine Empire as the province of Bulgaria (Theme of Bulgaria) and the Bulgarian Patriarchate was reduced in rank to an Archbishopric. Intermittent Slavic uprisings continued to occur, often with the support of the Serbian princedoms to the north. Any temporary independence that might have been gained was usually crushed swiftly by the Byzantines. It was also marked by periods of war between the Normans and Byzantium. The Normans launched offensives from their lands acquired in southern Italy, and temporarily gained rule over small areas in the northwestern coast. From the 12th century, parts of Macedonia were conquered by the Serbian kingdom of Raška. In the 13th century, following the Fourth Crusade, Macedonia was disputed among Byzantine Greeks, Latin crusaders of the short-lived Kingdom of Thessalonica, and the revived Bulgarian state. Most of southern Macedonia was secured by the Despotate of Epirus and then by the Empire of Nicaea, while the north was ruled by Bulgaria. After 1261 however, all of Macedonia returned to Byzantine rule, where it largely remained until the Byzantine civil war of 1341–1347. Taking advantage of this conflict, the Serb ruler Stefan Dushan expanded his realm and founded the Serbian Empire, which included all of Macedonia, northern and central Greece – excluding Thessaloniki, Athens and the Peloponnese. Dushan's empire however broke up shortly after his death in 1355. After his death rulers of Macedonia were Vukašin Mrnjavčević and his son Marko Mrnjavčević. At this time, the Ottoman threat was looming in the Balkans, as the Ottomans defeated the various Christian principalities, whether Serb, Bulgarian or Greek. After the Ottoman victory in the Battle of Maritsa in 1371, most of Macedonia accepted vassalage to the Ottomans and by the end of the 14th century the Ottoman Empire fully annexed it. Macedonia remained a part of the Ottoman Empire for nearly 500 years, during which time it gained a substantial Turkish minority. Thessaloniki later become the home of a large Sephardi Jewish population following the expulsions of Jews after 1492 from Spain. Over the centuries Macedonia had become a multicultural region. The historical references mention Greeks, Bulgarians, Turks, Albanians, Gypsies, Jews and Vlachs. It is often[who?] claimed that macédoine, the fruit or vegetable salad, was named after the area's very mixed population, as it could be witnessed at the end of the 19th century. From the Middle Ages to the early 20th century the Slavic-speaking population in Macedonia was identified mostly as Bulgarian. Some will ask why I speak of breaking away from the Bulgarians when in the past we have even called ourselves Bulgarians and when it is generally accepted that unification creates strength, and not separation. And, anyway, what sort of new Macedonian nation can this be when we and our fathers and grandfathers and great-grandfathers have always been called Bulgarians? After the revival of Greek, Serbian, and Bulgarian statehood in the 19th century, the Ottoman lands in Europe that became identified as "Macedonia", were contested by all three governments, leading to the creation in the 1890s and 1900s of rival armed groups who divided their efforts between fighting the Turks and one another. The most important of these was the Bulgarian Macedonian-Adrianople Revolutionary Committee (BMARC, SMARO from 1902) (an alternative version says that it consisted of the Macedonian Revolutionary Organization (MRO, TMORO from 1902), under Gotse Delchev who in 1903 rebelled in the so-called Ilinden-Preobrazhenie Uprising, fighting for an autonomous or independent Macedonian state (before 1902 only Bulgarians could join, but afterward, it invited "any Macedonian or Odrinian, irrespective of nationality, to join together"), and the Greek efforts from 1904 until 1908 (Greek Struggle for Macedonia). Diplomatic intervention by the European powers led to plans for an autonomous Macedonia under Ottoman rule. The restricted borders of the modern Greek state at its inception in 1830 disappointed the inhabitants of northern Greece (Epirus and Macedonia). Addressing these concerns in 1844, the Greek Prime Minister Kolettis addressed the constitutional assembly in Athens that "the Kingdom of Greece is not Greece; it is only a part, the smallest and poorest, of Greece. The Greek is not only he who inhabits the kingdom, but also he who lives in Ioannina, or Thessaloniki, or Serres, or Odrin" . He mentions cities and islands that were under Ottoman possession as composing the Great Idea (Greek: Μεγάλη Ιδέα, Megáli Idéa) which meant the reconstruction of the classical Greek world or the revival of the Byzantine Empire. The important idea here is that for Greece, Macedonia was a region with large Greek populations expecting annexation to the new Greek state. 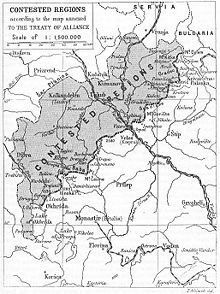 At this time, the region which today is known as the Republic of North Macedonia was part of the Kosovo Vilayet. The 1878 Congress of Berlin changed the Balkan map again. The treaty restored Macedonia and Thrace to the Ottoman Empire. Serbia, Romania and Montenegro were granted full independence, and some territorial expansion at the expense of the Ottoman Empire. Russia would maintain military advisors in Bulgaria and Eastern Rumelia until May 1879. Austria-Hungary was permitted to occupy Bosnia, Herzegovina and the Sanjak of Novi Pazar. The Congress of Berlin also forced Bulgaria, newly given autonomy by the 1878 Treaty of San Stefano, to return over half of its newly gained territory to the Ottoman Empire. This included Macedonia, a large part of which was given to Bulgaria, due to Russian pressure and the presence of significant numbers of Bulgarians and adherents to the Bulgarian Exarchate. The territorial losses dissatisfied Bulgaria; this fuelled the ambitions of many Bulgarian politicians for the following seventy years, who wanted to review the treaty – by peaceful or military means and to reunite all lands which they claimed had a Bulgarian majority. Besides, Serbia was now interested in the Macedonian lands, until then only Greece was Bulgaria's main contender, which after the addition of Thessaly to Greece in (1881) was bordering Macedonia. Thus, the Berlin Congress renewed the struggle for Turkey in Europe, including the so-called Macedonia region, rather than setting up a permanent regime. In the following years, all of the neighboring states struggled over Turkey in Europe; they were only kept at bay by their own restraints, the Ottoman Army and the territorial ambitions of the Great Powers in the region. Serbian policy had a distinct anti-Bulgarian flavor, attempting to prevent the Bulgarian influencing the inhabitants of Macedonia. On the other hand, Bulgaria was using the power of its religious institutions (Bulgarian Exarchate established in 1870) to promote its language and make more people identify with Bulgaria. Greece, in addition, was in an advantageous position for protecting its interests through the influence of Patriarchate of Constantinople which traditionally sponsored Greek-language and Greek-culture schools also in villages with few Greeks. This put the Patriarchate in dispute with the Exarchate, which established schools with Bulgarian education. Indeed, belonging to one or another institution could define a person's national identity. Simply, if a person supported the Patriarchate they were regarded as Greek, whereas if they supported the Exarchate they were regarded as Bulgarian. Locally, however, villagers were not always able to express freely their association with one or the other institution as there were numerous armed groups trying to defend and/or expand the territory of each. Some were locally recruited and self-organized while others were sent and armed by the protecting states. The aim of the adversaries, however, was not primarily to extend their influence over Macedonia but merely to prevent Macedonia succumbing to the influence of the other. This often violent attempt to persuade the people that they belonged to one ethnic group or another pushed some people to reject both. The severe pressure on the peaceful peasants of Macedonia worked against the plans of the Serbians and Bulgarians to make them adopt their ethnic idea and eventually a social divide became apparent. The British Ambassador in Belgrade in 1927 said: "At present the unfortunate Macedonian peasant is between the hammer and the anvil. One day 'comitadjis' come to his house and demand under threat lodging, food and money and the next day the gendarm hales him off to prison for having given them; the Macedonian is really a peaceable, fairly industrious agriculturist and if the (Serbian) government give him adequate protection, education, freedom from malaria and decent communications, there seems no reason why he should not become just as Serbian in sentiment as he was Bulgarian 10 years ago". As a result of this game of tug-of-war, the development of a distinct Macedonian national identity was impeded and delayed. Moreover, when the imperialistic plans of the surrounding states made possible the division of Macedonia, some Macedonian intellectuals such as Misirkov mentioned the necessity of creating a Macedonian national identity which would distinguish the Macedonian Slavs from Bulgarians, Serbians or Greeks. Baptizing Macedonian Slavs as Serbian or Bulgarian aimed therefore to justify these countries' territorial claims over Macedonia. The Greek side, with the assistance of the Patriarchate that was responsible for the schools, could more easily maintain control, because they were spreading Greek identity. For the very same reason the Bulgarians, when preparing the Exarchate's government (1871) included Macedonians in the assembly as "brothers" to prevent any ethnic diversification. On the other hand, the Serbs, unable to establish Serbian-speaking schools, used propaganda. Their main concern was to prevent the Slavic-speaking Macedonians from acquiring Bulgarian identity through concentrating on the myth of the ancient origins of the Macedonians and simultaneously by the classification of Bulgarians as Tatars and not as Slavs, emphasizing their 'Macedonian' characteristics as an intermediate stage between Serbs and Bulgarians. To sum up the Serbian propaganda attempted to inspire the Macedonians with a separate ethnic identity to diminish the Bulgarian influence. This choice was the 'Macedonian ethnicity'. The Bulgarians never accepted an ethnic diversity from the Slav Macedonians, giving geographic meaning to the term. In 1893 they established the Internal Macedonian Revolutionary Organization (VMRO) aiming to confront the Serbian and Greek action in Macedonia. VMRO hoped to answer the Macedonian question through a revolutionary movement, and so they instigated the Ilinden Uprising (1903) to release some Ottoman territory. Bulgaria used this to internationalize the Macedonian question. Ilinden changed Greece's stance which decided to take Para-military action. In order to protect the Greek Macedonians and Greek interests, Greece sent officers to train guerrillas and organize militias (Macedonian Struggle), known as makedonomahi (Macedonian fighters), essentially to fight the Bulgarians. After that it was obvious that the Macedonian Question could be answered only with a war. The rise of the Albanian and the Turkish nationalism after 1908, however, prompted Greece, Serbia and Bulgaria to bury their differences with regard to Macedonia and to form a joint coalition against the Ottoman Empire in 1912. Disregarding public opinion in Bulgaria, which was in support of the establishment of an autonomous Macedonian province under a Christian governor, the Bulgarian government entered a pre-war treaty with Serbia which divided the region into two parts. The part of Macedonia west and north of the line of partition was contested by both Serbia and Bulgaria and was subject to the arbitration of the Russian Tsar after the war. Serbia formally renounced any claims to the part of Macedonia south and east of the line, which was declared to be within the Bulgarian sphere of interest. The pre-treaty between Greece and Bulgaria, however, did not include any agreement on the division of the conquered territories – evidently both countries hoped to occupy as much territory as possible having their sights primarily set on Thessaloniki. In the First Balkan War, Bulgaria, Serbia, Greece and Montenegro occupied almost all Ottoman-held territories in Europe. Bulgaria bore the brunt of the war fighting on the Thracian front against the main Ottoman forces. Both her war expenditures and casualties in the First Balkan War were higher than those of Serbia, Greece and Montenegro combined. Macedonia itself was occupied by Greek, Serbian and Bulgarian forces. The Ottoman Empire in the Treaty of London in May 1913 assigned the whole of Macedonia to the Balkan League, without, specifying the division of the region, to promote problems between the allies. Dissatisfied with the creation of an autonomous Albanian state, which denied her access to the Adriatic, Serbia asked for the suspension of the pre-war division treaty and demanded from Bulgaria greater territorial concessions in Macedonia. Later in May the same year, Greece and Serbia signed a secret treaty in Thessaloniki stipulating the division of Macedonia according to the existing lines of control. Both Serbia and Greece, as well as Bulgaria, started to prepare for a final war of partition. In June 1913, Bulgarian Tsar Ferdinand, without consulting the government, and without any declaration of war, ordered Bulgarian troops to attack the Greek and Serbian troops in Macedonia, initiating the Second Balkan War. The Bulgarian army was in full retreat in all fronts. The Serbian army chose to stop its operations when achieved all its territorial goals and only then the Bulgarian army took a breath. During the last two days the Bulgarians managed to achieve a defensive victory against the advancing Greek army in the Kresna Gorge. However at the same time the Romanian army crossed the undefended northern border and easily advanced towards Sofia. Romania interfered in the war, in order to satisfy its territorial claims against Bulgaria. The Ottoman Empire also interfered, easily reassuming control of Eastern Thrace with Edirne. The Second Balkan War, also known as Inter-Ally War, left Bulgaria only with the Struma valley and a small part of Thrace with minor ports at the Aegean sea. Vardar Macedonia was incorporated into Serbia and thereafter referred to as South Serbia. Southern (Aegean) Macedonia was incorporated into Greece and thereafter was referred to as northern Greece. The region suffered heavily during the Second Balkan War. During its advance at the end of June, the Greek army set fire to the Bulgarian quarter of the town of Kilkis and over 160 villages around Kilkis and Serres driving some 50,000 refugees into Bulgaria proper. The Bulgarian army retaliated by burning the Greek quarter of Serres and by arming Muslims from the region of Drama which led to a massacre of Greek civilians. In September 1915, the Greek government authorized the landing of the troops in Thessaloniki. In 1916 the pro-German King of Greece agreed with the Germans to allow military forces of the Central Powers to enter Greek Macedonia to attack Bulgarian forces in Thessaloniki. As a result, Bulgarian troops occupied the eastern part of Greek Macedonia, including the port of Kavala. The region was, however, restored to Greece following the victory of the Allies in 1918. After the destruction of the Greek Army in Asia Minor in 1922 Greece and Turkey exchanged most of Macedonia's Turkish minority and the Greek inhabitants of Thrace and Anatolia, as a result of which Aegean Macedonia experienced a large addition to its population and became overwhelmingly Greek in ethnic composition. Serbian-ruled Macedonia was incorporated into the Kingdom of Serbs, Croats and Slovenes (later the Kingdom of Yugoslavia) in 1918. Yugoslav Macedonia was subsequently subjected to an intense process of "Serbianization" during the 1920s and 1930s. During World War II the boundaries of the region shifted yet again. When the German forces occupied the area, most of Yugoslav Macedonia and part of Aegean Macedonia were transferred for administration to Bulgaria. During the Bulgarian administration of Eastern Greek Macedonia, some 100,000 Bulgarian refugees from the region were resettled there and perhaps as many Greeks were deported or fled to other parts of Greece. Western Aegean Macedonia was occupied by Italy, with the western parts of Yugoslav Macedonia being annexed to Italian-occupied Albania. The remainder of Greek Macedonia (including all of the coast) was occupied by Nazi Germany. One of the worst episodes of the Holocaust happened here when 60,000 Jews from Thessaloniki were deported to extermination camps in occupied Poland. Only a few thousand survived. After this civil war, a large number of former ELAS fighters who took refuge in communist Bulgaria and Yugoslavia and described themselves as "ethnic Macedonians" were prohibited from reestablishing to their former estates by the Greek authorities. Most of them were accused in Greece for crimes committed during the period of the German occupation. The imminent collapse of the Ottoman Empire was welcomed by the Balkan states, as it promised to restore their European territory. The Young Turk Revolution of 1908 proved a nationalistic movement thwarting the peoples' expectations of the empire's modernization and hastened the end of the Ottoman occupation of the Balkans. To this end, an alliance was struck among the Balkan states in Spring 1913. The First Balkan War, which lasted six weeks, commenced in August 1912, when Montenegro declared war on the Ottoman Empire, whose forces ultimately engaged four different wars in Thrace, Macedonia, Northern and Southern Albania and Kosovo. The Macedonian campaign was fought in atrocious conditions. The retreat of the Ottoman army from Macedonia succeeded the desperate effort of the Greek and Bulgarian forces to reach the city of Thessalonica, the "single prize of the first Balkan War" for whose status no prior agreements were done. In this case possession would be equal to acquisition. The Greek forces entered the city first liberating officially, a progress only positive for them. Glenny says: "for the Greeks it was a good war". The first Balkan War managed to liberate Balkans from Turks and settled the major issues except Macedonia. In the spring 1913 the Serbs and Greeks begun the 'Serbianization' and the 'Hellenization' of the parts in Macedonia they already controlled, while Bulgarians faced some difficulties against the Jews and the Turkish populations. Moreover, the possession of Thessalonica was a living dream for the Bulgarians that were preparing for a new war. For this, the Bulgarian troops had a secret order in June 1913 to launch surprise attacks on the Serbs. Greece and Serbia signed a previous bilateral defensive agreement (May 1913). Consequently, Bulgaria decided to attack Greece and Serbia. After some initial gains the Bulgarians were forced to retreat back to Bulgaria proper and lose nearly all of the land they had conquered during the first war. The Treaty of Bucharest (August 1913) took off most of the Bulgarian conquests of the previous years. Large part of Macedonia became Southern Serbia, including the territory of what today is the Republic of North Macedonia and Aegean Macedonia became Northern Greece. Greece almost doubled its territory and population size and its northern frontiers remain today, more or less the same since the Balkan Wars. However, when Serbia acquired 'Vardarska Banovina' (the present-day Republic of North Macedonia), it launched having expansionist views aiming to descend to the Aegean, with Thessalonica as the highest ambition. However, Greece after the population exchange with Bulgaria, soon after its victory in the Balkan wars, managed to give national homogeneity in the Aegean and any remaining Slavic-speakers were absorbed. Many volunteers from Macedonia joined Bulgarian army and participated in the battles against Bulgarian enemies in these wars—on the strength of the Macedonian-Adrianopolitan Volunteer Corps and other units. After World War I Macedonian Campaign the status quo of Macedonia remained the same. The establishment of the 'Kingdom of Serbians, Croats and Slovenes' in 1918, which in 1929 was renamed 'Yugoslavia' (South Slavia) predicted no special regime for Skopje neither recognized any Macedonian national identity. In fact, the claims to Macedonian identity remained silent at a propaganda level because, eventually, North Macedonia had been a Serbian conquest. The situation in Serbian Macedonia changed after the Communist Revolution in Russia (1918–1919). According to Sfetas, Comintern was handling Macedonia as a matter of tactics, depending on the political circumstances. In the early 1920s it supported the position for a single and independent Macedonia in a Balkan Soviet Democracy. Actually, the Soviets desired a common front of the Bulgarian communist agriculturists and the Bulgarian-Macedonian societies to destabilize the Balkan Peninsula. The Internal Macedonian Revolutionary Organization (IMRO), under the protection of Comintern, promoted the idea of an independent Macedonia in a Federation of Balkan states, unifying all Macedonians. However, the possible participation of Bulgaria in a new war, on the Axis side, ended the Soviet support some years later. Bulgaria joined the Axis powers in 1941, when German troops prepared to invade Greece from Romania reached the Bulgarian borders and demanded permission to pass through Bulgarian territory. Threatened by direct military confrontation, Tsar Boris III had no choice but to join the fascist block, which officially happened on 1 March 1941. There was little popular opposition, since the Soviet Union was in a non-aggression pact with Germany. On 6 April 1941, despite having officially joined the Axis Powers, the Bulgarian government maintained a course of military passivity during the initial stages of the invasion of Yugoslavia and the Battle of Greece. As German, Italian, and Hungarian troops crushed Yugoslavia and Greece, the Bulgarians remained on the sidelines. The Yugoslav government surrendered on 17 April. The Greek government was to hold out until 30 April. On 20 April, the period of Bulgarian passivity ended. The Bulgarian Army entered the Aegean region. The goal was to gain an Aegean Sea outlet in Thrace and Eastern Macedonia and much of eastern Serbia. The so-called Vardar Banovina was divided between Bulgaria and Italians which occupied West Macedonia. The Bulgarian occupation of Macedonia was viewed as oppressive by the inhabitants of the region, further distancing any previous affiliations between Macedonian and Bulgarians. During the German occupation of Greece (1941–1944) the Greek Communist Party-KKE was the main resistance factor with its military branch EAM-ELAS (National Liberation Front). Although many members of EAM were Slavic-speaking, they had either Bulgarian, Greek or distinct Macedonian conscience. To take advantage of the situation KKE established SNOF with the cooperation of the Yugoslav leader Tito, who was ambitious enough to make plans for Greek Macedonia. For this he established the Anti-Fascistic Assembly for the National Liberation of Macedonia (ASNOM) giving an actual liberating character to the whole region of Macedonia. Besides, KKE was very positive to the option of a greater Macedonia, including the Greek region, since it realized that a victory in the Greek Civil War was utopic. Later EAM and SNOF disagreed in issues of policy and they finally crashed and the latter was expelled from Greece (1944). The end of the War did not bring peace to Greece and a strenuous civil war between the Government forces and EAM broke out with about 50,000 casualties for both sides. The defeat of the Communists in 1949 forced their Slav-speaking members to either leave Greece or fully adopt Greek language and surnames. The Slav minorities were discriminated against, and not even recognised as a minority. Since 1923 the only internationally recognized minority in Greece are the Muslims in Western Thrace. Yugoslav Macedonia was the only region where Yugoslav communist leader Josip Broz Tito had not developed a Partisan movement because of the Bulgarian occupation of a large part of that area. To improve the situation, in 1943 the Communist Party of 'Macedonia' was established in Tetovo with the prospect that it would support the resistance against the Axis. In the meantime, the Bulgarians' violent repression led to loss of moral support from the civilian population. By the end of the war "a Macedonia national consciousness hardly existed beyond a general conviction, gained from bitter experience, that rule from Sofia was as unpalatable as that from Belgrade. But if there were no Macedonian nation there was a Communist Party of Macedonia, around which the People's Republic of Macedonia was built". Tito thus separated Yugoslav Macedonia from Serbia after the war. It became a republic of the new federal Yugoslavia (as the Socialist Republic of Macedonia) in 1946, with its capital at Skopje. Tito also promoted the concept of a separate Macedonian nation, as a means of severing the ties of the Slav population of Yugoslav Macedonia with Bulgaria. Although the Macedonian language is very close to Bulgarian, the differences were deliberately emphasized and the region's historical figures were promoted as being uniquely Macedonian (rather than Serbian or Bulgarian). A separate Macedonian Orthodox Church was established, splitting off from the Serbian Orthodox Church, but it has not been recognized by any other Orthodox Church, including the Ecumenical Patriarchate of Constantinople. The Communist Party sought to deter pro-Bulgarian sentiment, which was punished severely; convictions were still being handed down as late as 1991. Tito had a number of reasons for doing this. First, as an ethnic Croat, he wanted to reduce Serbia's dominance in Yugoslavia; establishing a territory formerly considered Serbian as an equal to Serbia within Yugoslavia achieved this effect. Secondly, he wanted to sever the ties of the Macedonian Slav population with Bulgaria because recognition of that population as Bulgarian would have undermined the unity of the Yugoslav federation. Third of all, Tito sought to justify future Yugoslav claims towards the rest of Macedonia (Pirin and Aegean), in the name of the "liberation" of the region. The potential "Macedonian" state would remain as a constituent republic within Yugoslavia, and so Yugoslavia would manage to get access to the Aegean Sea. Tito's designs on Macedonia were asserted as early as August 1944, when in a proclamation he claimed that his goal was to reunify "all parts of Macedonia, divided in 1912 and 1913 by Balkan imperialists". To this end, he opened negotiations with Bulgaria for a new federal state, which would also probably have included Albania, and supported the Greek Communists in the Greek Civil War. The idea of reunification of all of Macedonia under Communist rule was abandoned as late as 1949 when the Greek Communists lost and Tito fell out with the Soviet Union and pro-Soviet Bulgaria. Across the border in Greece, Slavophones were seen as a potentially disloyal "fifth column" within the Greek state by both the US and Greece, and their existence as a minority was officially denied. Greeks were resettled in the region many of whom emigrated (especially to Australia) along with many Greek-speaking natives, because of the hard economic conditions after the Second World War and the Greek Civil War. Although there was some liberalization between 1959 and 1967, the Greek military dictatorship re-imposed harsh restrictions. The situation gradually eased after Greece's return to democracy, although even as recently as the 1990s Greece has been criticised by international human rights activists for "harassing" Macedonian Slav political activists, who, nonetheless, are free to maintain their own political party (Rainbow). Elsewhere in Greek Macedonia, economic development after the war was brisk and the area rapidly became the most prosperous part of the region. The coast was heavily developed for tourism, particularly on the Halkidiki peninsula. Under Georgi Dimitrov, Soviet loyalist and head of the Comintern, Bulgaria initially accepted the existence of a distinctive Macedonian identity. It had been agreed that Pirin Macedonia would join Yugoslav Macedonia and for this reason the population declared itself "Macedonian" in the 1946 census. This caused resentment and many people were imprisoned or interned in rural areas outside Macedonia. After Tito's split from the Soviet bloc this position was abandoned and the existence of a Macedonian nation or language was denied. Attempts of Macedonian historians after the 1940s to claim a number of prominent figures of the 19th century Bulgarian cultural revival and armed resistance movement as Macedonians has caused ever since a bitter resentment in Sofia. Bulgaria has repeatedly accused the Republic of North Macedonia of appropriating Bulgarian national heroes and symbols and of editing works of literature and historical documents so as to prove the existence of a Macedonian Slav consciousness before the 1940s. The publication in the Republic of North Macedonia of the folk song collections 'Bulgarian Folk Songs' by the Miladinov Brothers and 'Songs of the Macedonian Bulgarians' by Serbian archaeologist Verkovic under the "politically correct" titles 'Collection' and 'Macedonian Folk Songs' are some of the examples quoted by the Bulgarians. The issue has soured the relations of Bulgaria with former Yugoslavia and later with the Republic of North Macedonia for decades. Kiro Gligorov, the president of Yugoslav Macedonia, sought to keep his republic outside the fray of the Yugoslav wars in the early 1990s. Yugoslav Macedonia's very existence had depended on the active support of the Yugoslav state and Communist Party. As both began to collapse, the Macedonian authorities allowed and encouraged a stronger assertion of Macedonian Slav national identity than before. This included toleration of demands from Macedonian Slav nationalists for the reunification of Macedonia. The Albanians in the Republic of North Macedonia were unhappy about an erosion of their national rights in the face of a more assertive Macedonian Slav nationalism. Some nationalist Serbs called for the republic's re-incorporation into Serbia, although in practice this was never a likely prospect, given Serbia's preoccupation with the wars in Bosnia and Croatia and the relatively small number of Serbs in the Republic of North Macedonia compared to Croatia and Bosnia and Herzegovina. As communism fell throughout Eastern Europe in the late 20th century, Macedonia followed its other federation partners and declared its independence from Yugoslavia in late 1991. In 1991, the (then Socialist) Republic of North Macedonia held a referendum on independence which produced an overwhelming majority in favour of independence. The referendum was boycotted by the ethnic Albanians, although they did create ethnic political parties and actively contributed in the Macedonian government, parliament etc. The republic seceded peacefully from the Yugoslav federation, declaring its independence as the Socialist Republic of North Macedonia. Bulgaria was consequently the first country to officially recognise Republic of North Macedonia's independence – as early as February 1992, followed by other countries as well. The new Macedonian constitution took effect 20 November 1991 and called for a system of government based on a parliamentary democracy. Kiro Gligorov became the first President of the new independent state, succeeded by Boris Trajkovski. In early January 2001 armed conflict took place between the ethnic Albanian National Liberation Army (UÇK) militant group and the Republic of North Macedonia's security forces. The conflict partially ended with the signing of the Ohrid Framework Agreement by the government of the Republic of North Macedonia and Albanian representatives on 13 August 2001, which provided for greater rights for Macedonian Albanian population. In January 2002, the Macedonian conflict ended when the amnesty was announced to Albanian irregulars and rebels. Occasional unrest continued throughout 2002. A controversy exists in regard to whether or not any parts of the historic region of Macedonia are incorporated in the present-day Republic of North Macedonia, as very little if any of the ancient Macedonian kingdom is. There is also controversy, however, with regard to the Slavic peoples who are concentrated in less than half of the region. They first arrived in the late 6th and early 7th centuries AD when Slavic-speaking populations overturned Macedonia's Greek ethnic composition. As a result, the appropriation by the "Republic of North Macedonia" of what Greece held as its "Greek symbols", raised concerns in Greece as well as fuelling nationalist anger. This anger was reinforced by the legacy of the Civil War and the view in some quarters, that members of Greece's Slavic-speaking minority were pro-Yugoslavian and presented a danger to its borders. The status of the Republic of North Macedonia became a heated political issue in Greece where demonstrations took place in Athens while one million Macedonian Greeks took to the streets in Thessaloniki in 1992, under the slogan: "Macedonia is Greek", referring to the name and ancient history of the region, not posing a territorial claim against their northern neighbor. Initially, the Greek government objected formally to any use of the name Macedonia (including any derivative names) and also to the use of symbols such as the Vergina Sun. On the other hand, also in 1992, demonstrations by more than 100,000 ethnic Slav Macedonians took place in Skopje, the capital of the Republic of North Macedonia, over the failure to receive recognition and supporting the constitutional name of the country. The controversy was not just nationalist, but it also played out in Greece's internal politics. The two leading Greek political parties, the ruling conservative New Democracy under Constantine Mitsotakis and the socialist PASOK under Andreas Papandreou, sought to outbid each other in whipping up nationalist sentiment and the long-term (rather than immediate) threat posed by the apparent irredentist policies of Skopje. To complicate matters further, New Democracy itself was divided; the then prime minister, Mitsotakis, favored a compromise solution on the Macedonian question, while his foreign minister Adonis Samaras took a hard-line approach. The two eventually fell out and Samaras was sacked, with Mitsotakis reserving the foreign ministry for himself. He failed to reach an agreement on the Macedonian issue despite United Nations mediation; he fell from power in October 1993, largely as a result of Samaras causing the government's majority of one to fall in September 1993. When Andreas Papandreou took power following the October 1993 elections, he established a "hard line" position on the issue. The United Nations recommended recognition of the "Republic of North Macedonia" under the temporary name of the "former Yugoslav Republic of Macedonia", which would be used internationally while the country continued to use "Republic of Macedonia" as its constitutional name. The United States and European Union (therefore, including Greece) agreed to this proposal and duly recognised the Republic of North Macedonia. This was followed by new, though smaller demonstrations in Greek cities against what was termed a "betrayal" by Greece's allies. Papandreou supported and encouraged the demonstrations, boosting his own popularity by taking the "hard line" against the Republic of North Macedonia. In February 1994, he imposed a total trade embargo on the country, with the exception of food, medicines and humanitarian aid. The effect on the Republic of North Macedonia's economy was limited, mainly because the real damage to its economy had been caused by the collapse of Yugoslavia and the loss of central European markets due to the war. Also, many Greeks broke the trade embargo by entering through Bulgaria. However, the embargo had bad impact on the Republic of North Macedonia's economy as the country was cut off from the port of Thessaloniki and became landlocked because of the UN embargo on Yugoslavia to the north, and the Greek embargo to the south. Later, the signing of the Interim accord between Greece and the Republic of North Macedonia marked the increased cooperation between the two neighboring states. The blockade had a political cost for Greece, as there was little understanding or sympathy for the country's position, and exasperation over what was seen as Greek obstructionism from some of its European Union partners. Athens was criticized in some quarters for contributing to the rising tension in the Balkans, even though the wars in the former Yugoslavia were widely seen as having been triggered by the premature recognition of its successor republics, a move to which Greece had objected from the beginning. It later emerged that Greece had only agreed to the dissolution of Yugoslavia in return for EU solidarity on the Macedonian issue. In 1994, the European Commission took Greece to the European Court of Justice in an effort to overturn the embargo, but while the court provisionally ruled in Greece's favor, the embargo was lifted by Athens the following year before a final verdict was reached. This was for the "Republic of North Macedonia" and Greece to enter into an "interim agreement" in which the Republic of North Macedonia agreed to remove any implied territorial claims to the greater Macedonia region from its constitution and to drop the Vergina Sun from its flag. In return, Greece lifted the blockade. Before 2019, most countries recognised the Republic of North Macedonia under its former constitutional name, the Republic of Macedonia, notably the United States, the People's Republic of China and Russia, and also its neighbours Bulgaria, Serbia, although as the country was referred in the UN only under the provisional reference the "former Yugoslav Republic of Macedonia", the constitutional name was generally used only in bilateral relations and in relations where a state not recognising the former constitutional name was not a party. Discussions continued over the Greek objection regarding the country's name, with the Greek government linking progress on the issue to the Republic of North Macedonia's accession to the European Union and NATO (for more on this, see Accession of Macedonia to the European Union). The Republic of North Macedonia, Croatia and Albania were qualified to join NATO and an invitation for those three countries was planned to be issued on the NATO summit in Bucharest (Romania), in April 2008. Before the beginning of the summit, the American president Bush said that NATO would make a historic decision on the admission of three Balkan nations: Croatia, Albania and Macedonia; and that the United States strongly supported inviting these nations to join NATO. However, during the summit NATO leaders decided not to extend a membership invitation to Macedonia because Greece vetoed the move after the dispute over the name issue. The Macedonian representative and negotiator with Greece in the name issue complained that the Republic of North Macedonia was punished not because it had failed to fulfill NATO accession criteria, but because it had been trying to defend its national identity. The NATO leaders agreed to extend a membership invitation for Macedonia as soon as the name issue with Greece is resolved, but until now no progress has been made in the negotiations between the Republic of North Macedonia and Greece to resolve the name issue. In November 2008, Republic of North Macedonia filed a lawsuit against Greece before the International Court of Justice in The Hague accusing Athens that it violated the Interim Accord by blocking its NATO membership. In 1995, the two countries signed an agreement by which Macedonia agreed to use the provisional reference in international organizations, while Greece pledged not to block Macedonia's integration into the European Union and NATO. In March 2009, the European Parliament expressed support for the Republic of North Macedonia's EU candidacy and asked the EU to grant the country a date for the start of accession talks by the end of 2009, regretting that the country is waiting three years after the country was granted a candidate status, which makes a demoralizing effect on Macedonia and brings risks of destabilizing the whole region. The parliament also recommended a speedy lifting of the visa regime for the country citizens. The number of ethnic Macedonians in Bulgaria is controversial as several Bulgarian censuses showed conflicting numbers of ethnic Macedonians living in that country. As the Bulgarian authorities did not publish the results of the 1946 census regarding the number of ethnic Macedonians in Bulgaria, Yugoslav sources claimed that some 252,000 people declared themselves as Macedonians in that census. Bulgarian embassy in London in 1991 stated that some 169,000 people were recorded as Macedonians on the same census. The census in 1956 registered 187,789 ethnic Macedonians in Bulgaria. During this period the Macedonian Language was to be the official language of Pirin Macedonia. In 1992 the number of the ethnic Macedonians was 10,803 and in 2001 only 5,071 citizens declared as ethnic Macedonians. Bulgarian governments and public opinion throughout the period continued their policy of non-recognition of Macedonians as a distinct ethnic group. The recent Bulgarian view on the issue is that the Bulgarian policy after the Second World War regarding the Macedonians in Bulgaria was conducted despite the unwillingness of the local population to cooperate, in the conditions of the pressure and reprisals by the Bulgarian communists authorities against the Bulgarians in Pirin Macedonia. After 1958 when the pressure from Moscow decreased, Sofia turned back to the view that the separate Macedonian language did not exist and that the Macedonians in Blagoevgrad province (Pirin Macedonia) were actually Bulgarians. There are several ethnic Macedonian organizations in Bulgaria: "Traditional Macedonian Organization Ilinden", later renamed the "IMRO independent – Ilinden", registered in 1992 at the Sofia City Court. Later, in 1998, the organization was registered as a public NGO. The "United Macedonian Organization (UMO) – Ilinden" is another organization. In 1990, the Blagoevgrad District Court refused to register this organization as some parts of the organization statute were not in accordance with the Bulgarian Constitution. In October 1994 this association split up on three different factions. Later two wings were unified under the "UMO Ilinden – PIRIN" organization. In 1998 the European Commission of Human Rights gave admissibility to two out of five complaints of Macedonians from Pirin Macedonia. After the Bulgarian Electoral Committee endorsed in 2001 the registration of a wing of UMO Ilinden, which had dropped separatist demands from its Charter, the mother organization became largely inactive. In 2007, the Sofia City Court refused registration of UMO Ilinden Pirin organization, despite an October 2005 ruling by the European Court of Human Rights that a previous ban of the party violated rights to freedom of association and assembly. In November the European Parliament Rapporteur on Bulgaria and the Enlargement Commissioner of the European Commission urged the government to register the organization. There were repeated complaints of official harassment of ethnic Macedonian activists in the 1990s. Attempts of ethnic Macedonian organization UMO Ilinden to commemorate the grave of revolutionary Yane Sandanski throughout the 1990s were usually hampered by the Bulgarian police. Several incidents of mobbing of UMO Ilinden members by Bulgarian Macedonian organization IMRO activists were also reported. There is a newspaper published by the Macedonian organizations in Bulgaria, Narodna Volja ("People's Will"), which is printed in 2,500 copies. Some cases of harassment of organisations of the Bulgarians in Republic of North Macedonia and activists have been reported. In 2000 several teenagers threw smoke bombs at the conference of Bulgarian organisation Radko in Skopje, causing panic and confusion among the delegates. The North Macedonia Constitutional Court annulled the status and program of the organisation (hence terminating its existence), as those documents question the constitutional establishment of Macedonia and creating national and religious hatred and intolerance. Since then, apparently there are very little or not reported public activities of that organization. In 2001 Radko issued in Skopje the original version of the folk song collection Bulgarian Folk Songs by the Miladinov Brothers (issued under an edited name in the Republic of North Macedonia and viewed as a collection of Slav Macedonian lyrics). The book triggered a wave of other publications, among which the memoirs of the Greek bishop of Kastoria, in which he talked about the Greek-Bulgarian church struggle at the beginning of the 20th century, as well the Report of the Carnegie Commission on the causes and conduct of the Balkan Wars from 1913. Neither of these addressed the ethnic Macedonian population of Macedonia as Macedonians but as Bulgarians. Being the first publications to question the official Macedonian position of the existence of a distinct Macedonian identity going back to the time of Alexander the Great (Macedonism), the books triggered a reaction of shock and disbelief in Macedonian public opinion. The scandal after the publication of Bulgarian Folk Songs resulted in the sacking of the Macedonian Minister of Culture, Dimitar Dimitrov. As of 2000, Bulgaria started to grant Bulgarian citizenship to members of the Bulgarian minorities in a number of countries, including the Republic of North Macedonia. The vast majority of the applications have been from Macedonian citizens. As of May 2004, some 14,000 Macedonians had applied for a Bulgarian citizenship on the grounds of Bulgarian origin and 4,000 of them had already received their Bulgarian passports. According to the official Bulgarian sources, in the period between 2000 and 2006 some 30,000 Macedonian citizens applied for Bulgarian citizenship, attracted by the Bulgaria's recent positive development and the opportunity to get European Union passports after Bulgaria joined EU on the beginning of 2007. In 2006 the former Macedonian Premier and chief of IMRO-DPMNE Ljubčo Georgievski became a Bulgarian citizen. The rules governing good neighbourly relations agreed between Bulgaria and the Republic of North Macedonia were set in the Joint Declaration of 22 February 1999 reaffirmed by a joint memorandum signed on 22 January 2008 in Sofia. There are regular contacts between the Macedonian and Bulgarian officials, confirming the relatively good relationships between the two neighboring countries. Bulgaria has proposed to sign a treaty (based on that 1999 Joint Declaration) guaranteeing the good neighbourly relations between the two countries, to enable Bulgarian support for the accession of the Republic of North Macedonia to the European Union. Wikimedia Commons has media related to Macedonia (region). ^ The migrations during the early Byzantine centuries also changed the meaning of the geographical term Macedonia, which seems to have moved to the east together with some of the non-Slavic population of the old Roman province. In the early 9th century an administrative unit (theme) of Makedonikon was established in what is now Thrace (split among Bulgaria, Greece, and Turkey) with Adrianopleas its capital. It was the birthplace of Emperor Basil I (867–886), the founder of the so-called Macedonian dynasty in Byzantinum. Historical Dictionary of the Republic of Macedonia, Dimitar Bechev, Scarecrow Press, 2009, ISBN 0810862956, p. Iii. ^ By the beginning of the 9th century, the theme of Macedonia, with its capital at Adrianople consisted not of Macedonian but of Thracian territories. During the Byzantine period the Macedonia proper corresponded to the themes of Thessalonica and Strymon. The Ottoman administration ignored the name of Macedonia. It was only revived during the Renaissance, when western scholars rediscovered the ancient Greek geographical terminology. Brill's Companion to Ancient Macedon: Studies in the Archaeology and History of Macedon, 650 BC - 300 AD, Robin J. Fox, Robin Lane Fox, BRILL, 2011, ISBN 9004206507, p. 35. ^ When the barbarian invasions started in the fourth through seventh centuries AD in the Balkans, the remnants of the Hellenes who lived in Macedonia were pushed to eastern Thrace, the area between Adrianople (presently the Turkish city of Edirne) and Constantinople. This area would be called theme of Macedonia by the Byzantines... whereas the modern territory of R. of Macedonia was included in the theme of Bulgaria after the destruction of Samuels Bulgarian Empire in 1018. Contested Ethnic Identity: The Case of Macedonian Immigrants in Toronto, 1900-1996, Chris Kostov, Peter Lang, 2010, ISBN 3034301960, p. 48. ^ Mazedonien [Macedonia]. Meyers Großes Konversations-Lexikon (in German). 13. Leipzig. 1905. pp. 488–491. Neuerdings hat man sich wiederum gewöhnt, den Namen M. im Sinne der Alten, d. h. für das jetzige Wilajet Saloniki und den Süden des Wilajets Monastir, zu gebrauchen. ^ Brown, Keith; Ogilvie, Sarah, eds. (2008). Concise Encyclopedia of Languages of the World. Elsevier Science. p. 663. ISBN 0080877745. ^ "Διδακτικά Βιβλία του Παιδαγωγικού Ινστιτούτου". www.greek-language.gr. ^ "Northwestern Greece is home to an indeterminate number of citizens who speak a Slavic dialect at home, particularly in Florina province. Estimates ranged widely, from under 10,000 to 50,000. A small number identified themselves as belonging to a distinct ethnic group and asserted their right to "Macedonian" minority status" "2002 U.S. Country Reports on Human Rights Practices – Greece". 31 March 2003. ^ "Macedonian News: Macedonia's Former PM Ljubco Georgievski Received Bulgarian Citizenship (REVIEW)". Vmacedonianews.com. 16 July 2006. Retrieved 7 February 2013. ^ Wood, Nicholas (23 July 2006). "For Dream Jobs in Europe, the Line Forms in Bulgaria". The New York Times. Retrieved 5 April 2010. ^ Vladimir Georgiev - The Genesis of the Balkan Peoples, The Slavonic and East European Review, Vol. 44, No. 103 (Jul., 1966), pp. 285-297 ancient Macedonian is closely related to Greek, and Macedonian and Greek are descended from a common Greek-Macedonian idiom that was spoken till about the second half of the 3rd millennium BC. ^ "Paeonia - historical region". ^ Roisman & Worthington 2011, pp. 135-138, 342-345. ^ The Early Medieval Balkans. John Fine. Page 71: "In 688/89 the emperor Justinian II marched through Thrace where at least enough Byzantine rule had been restored for a theme administration to be established.... The purpose of the campaign was to punish the Bulgars and Slavs. Justinian successfully subdued many Slavs (taking many captives) and reached Thessaloniki. On his return toward Constantinople in 689 he was ambushed by the Bulgars who wiped out most of his army"
^ Karloukovski, Vassil. "J. Fraser - Pictures from the Balkans - 1". www.kroraina.com. ^ a b Henry Robert Wilkinson: Maps and Politics: A Review of the Ethnographic Cartography of Macedonia. Liverpool University Press, Liverpool 1951, pp. 73-74. ^ Republican-controlled federal government: "Background Note: Macedonia". Retrieved 8 September 2007. See also: Democratic-controlled Congress uses the designation "Republic of Macedonia (FYROM)": NATO "NATO Freedom Consolidation Act of 2007 (Enrolled as Agreed to or Passed by Both House and Senate)". Retrieved 12 June 2007. ^ "People's daily". China, Macedonia Sign Joint Communique on Normalization of Relations. Retrieved 2 January 2007. ^ "PM Gruevski signs Yeltsin book of condolence". Archived from the original on 20 October 2007. Retrieved 20 September 2007. ^ "Embassy of the Republic of Serbia". Skopje Republic of Macedonia. Archived from the original on 13 July 2007. Retrieved 2 January 2007. ^ John Pike (21 February 2008). "Albania, Croatia, Macedonia Qualify for NATO Membership, U.S. Official Says". Globalsecurity.org. Retrieved 7 February 2013. ^ "Greece stands by NATO veto threat for Macedonia – World Updates | The Star Online". Thestar.com.my. Archived from the original on 9 June 2008. Retrieved 7 February 2013. ^ "Bulgaria: Macedonia Remains Out of NATO Because of Greek Veto over Name Dispute – Novinite.com – Sofia News Agency". Novinite.com. 3 April 2008. Retrieved 7 February 2013. ^ "Macedonia sues Greece for blocking NATO entry". FRANCE 24. 17 November 2008. Retrieved 7 February 2013. ^ "Interim Accord" (PDF). United Nations. 1995. Archived from the original (PDF) on 25 March 2009. Retrieved 14 March 2009. ^ "All Balkans Home". Balkan Insight. 21 January 2011. Retrieved 7 February 2013. ^ Bulgaria, Kultura Weekly Newspaper - Sofia,. "Вестник "Култура", бр.8/9, 1 март 2002 г." www.online.bg. ^ "The Sofia Echo: 82 000 Foreigners apply for Bulgarian citizenship". 16 October 2006. Retrieved 11 March 2009. ^ "Former Macedonian Prime Minister received a Bulgarian passport" (in Bulgarian). Trud. 16 July 2006. ^ "Former Prime Minister of Macedonia became Bulgarian" (in Bulgarian). Monitor. 16 July 2006. Archived from the original on 6 July 2011. Retrieved 16 July 2006. ^ "Expremier-deputy of Macedonia Ljubcho Georgievski declared: "I'm Bulgarian" and received citizenship, passport and registration in Blagoevgrad, pulling down the pyramid of historical falsifications of Skopje" (in Bulgarian). Struma. 14 July 2006. Archived from the original on 4 November 2006. Retrieved 16 July 2006. ^ "Macedonian Radio Television:PM Gruevski visits Bulgaria, November 2007". Archived from the original on 29 September 2011. ^ "Contact Support". www.mia.com.mk. Archived from the original on 27 July 2011.